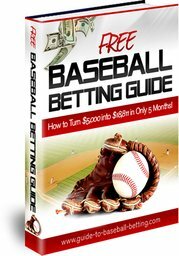 To assist you in developing your own strategy for betting on baseball, here are some MLB Betting Tips that you should consider. While baseball is one of the easiest sports to handicap, it does require some research. The first part of a great betting strategy is patience. With 30 teams playing 162 games each season, there are thousands of opportunities to place bets. Be selective and wait for the opportunities that give you the edge using these MLB betting tips. The most common mistake is betting with your heart, and not your brain. Don’t bet for the Yankees because you like that team. You need to look at each game objectively and bet accordingly. The first MLB Betting Tip is often overlooked by novice bettors but it is, in my opinion, the single most important key to profitable betting. It is tedious and time consuming but without a money management system, you will go broke – guaranteed! Once a successful money management strategy is in place, the rest is just about picking winners. Unit System. Many handicappers use a unit system based on the strength of the pick. For instance, they may assign 4 units to the Reds losing to the Phillies and 2 units to the Red Sox beating the Royals. Let’s say that you have a $5,000 bankroll. To determine the value of each unit divide $5,000 by 100 units. This equals $50 per unit. Using the above examples, you would bet $200 (4 units x $50) on the Phillies beating the Reds and $100 (2 units x $50) on the Red Sox beating the Royals. Flat Betting System. In this system all games are rated equally and as a result, you bet the same amount for each game. For example, let’s say you decide that you are going to bet 2% of your $5,000 bankroll on each game. Using the Phillies and Red Sox examples above, you would bet $100 on each game. Labouchere System. This is a powerful system because it allows you to make money even if your winning percentage is less than 50%. If you are new to this MLB betting tip, check out Labouchere System. The second MLB Betting Tip is a successful scheme in any sport, but betting underdogs is more important in baseball where even good teams lose 70-plus games each year. In 2010, $100 bettors that put a wager on every underdog would have lost $1,101.08. However, $100 bettors taking all favorites would have lost $5,046.33 (almost five times more than the dogs). The oddsmakers often inflate the line on the favorites because they know the general public likes to bet the favorites. Add a couple of filters and there is great value betting underdogs. The best baseball teams lose at least sixty games a year and the worst teams win close to that same number. In 2010, the best record in baseball belonged to the Philadelphia Phillies with a record of 97 wins and 65 losses. Pittsburgh owned the worst record of 57 wins and 105 losses. That means the worst team in baseball still won 35.2% of its games while the best team (during the regular season) won almost 60%. Consider that the more favorites you bet, the higher the percentage of wins you'll need to break even. For example, if your average bet is a –150 favorite you’ll need to hit 60% winners just to break even. At –170, that number increases to 63% and so on. Now consider the opposite. If your average bet is a +120 underdog, your break-even percentage drops to approximately 45.5%. At +140, it drops to just over 42% and the higher you go the lower the breakeven percentage. If you keep in mind that even the poorest baseball teams seldom win fewer than 35% of their games, it is obvious that a good baseball betting strategy must include this valuable MLB betting tip. The third MLB Betting Tip is all about getting the most value when picking favorites. While many successful baseball bettors look to play underdogs first, favorites frequently offer good value as well, such as top teams playing on the road as a slight favorite. However, the oddsmakers often inflate the odds on large favorites. Thus, you should implement a strict limit on how much you lay on a favorite. Odds -150 or better, play the money line. If you’re not familiar with lines see How to Read Lines. Odds between -151 and -200, split the wager approximately 65%/35% between the money line and the run line. Ideally what you want is to have enough money on the money line so if your team wins by only 1 run, the profit on the money line covers your loss on the run line (break even). For example, let’s say the money line is -175 and the run line is +125. You place $65 on the money line to win $37.14 and you place $35 on the run line to win $43.75. If your team wins by 1 run only, you profit $2.14 ($37.14 - $35.00). This MLB Betting Tip removes the risk of betting the run line. Odds -201 or worse, skip the bet. Why not play the run line in this instance? Although you would expect good teams to blow out weaker teams, this often does not happen. Teams that are heavily favored are more likely to win by exactly 1 run than a team close to pick’em. Thus, there is more value playing the run line “against” large favorites. The fourth MLB Betting Tip is to not over-emphasize the importance of pitching. Once you get past the top 20 or so pitchers in each league, most of the pitchers are fairly equal. Compare the two starting pitchers using a ranking system such as Sagarin’s Pitching System. Sagarin uses a complicated formula to rank the pitchers. If Sagarin ranks a particular pitcher higher who happens to pitch for the underdog, there may be some value there. How has each starting pitcher done against the opposing team? For example, Roy Oswalt is 22-1 when starting against Cincinnati with an ERA of 2.65 and a WHIP of 1.116. Note: there was more value for Oswalt when he pitched for Houston. How have the starting pitchers performed at home and on the road? For example, in 2010 Josh Johnson’s ERA at home and on the road was 1.57 and 3.27 respectively. You can get good value betting against a big name pitcher using this MLB Betting Tip. How do the pitchers perform in day and night games? For example, Adam Wainwright’s ERA during the day and night was 1.89 and 2.83 respectively. The fifth MLB Betting Tip is extremely important. Everyone knows that starting pitching is important – especially when you take into consideration their splits against certain pitchers and teams. However, what many novice bettors ignore is bullpen pitching. Understanding a team's bullpen strength is often more important than starting pitching. In 2006 the top five teams with the best bullpen earned run averages (ERA) were the Twins, Mets, Padres, Tigers and Athletics. They were also the five most profitable money line teams in 2006: Twins (+2,415), Mets (+1,728), Padres (+849), Tigers (+1,418) and Athletics (+1,984). In 2010, the five teams with the best MLB Bullpen ERA were the Padres (2.81), World Champ Giants (2.99), Braves (3.11), Devil Rays (3.33) and Nationals (3.33). For $100 bettors, the combined money line profit for these five teams was +$3,490.48 (not as good as 2006 but still very good). Coincidence? Not likely. This MLB Betting Tip will put money in your wallet. In addition to the bullpen ERA, pay attention to the bullpen workload. It may be smart to fade (bet against) a team that already has a weak bullpen and cannot use their best setup guy or closer because they are over worked. How have the hitters performed against left-handed starting pitchers? For example, in 2010 the Toronto Blue Jays scored an average of 4.66 runs per game over 162 games (ranked #9). However, against left-handed pitchers the Jays only scored 1.24 runs per game (ranked #30). How have the hitters performed at home and on the road? For example, in 2010 Colorado scored 479 runs at home (ranked #1) but only 291 on the road (ranked #28). The seventh and final MLB Betting Tip is to either avoid or fade public teams like the Yankees, Red Sox, Mets and Cubs. These organizations are often heavy favourites and you're less likely to make money on these clubs. Prior to the 2010 season, these four teams produced only four of a possible 16 profitable seasons over a four year span. If you had bet just $100 on each of their games over that span you would be down over $10,000. Conversely, by playing their opponents, the big dogs, you would have been up even more than that. In 2010, all four teams had losing seasons once again for money line bettors. As for TV games, the oddsmakers are well aware of what games are nationally televised and they know that most gamblers prefer to root for the favorite! You can bet that the favorite line and the over line will be inflated. You are much better off sticking to dogs and unders in TV games! If you take into consideration these MLB Betting Tips when developing your betting strategy, you will have a very profitable year betting on baseball.